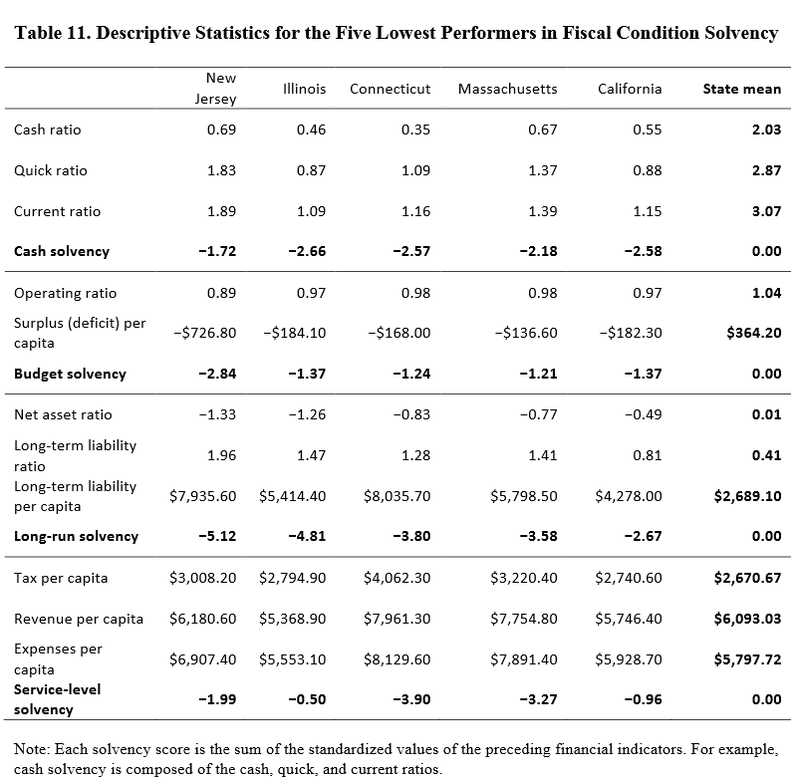 Inquiring minds are digging into a George Mason University paper on State Fiscal Conditions, a ranking of 50 states, by Sarah Arnett. 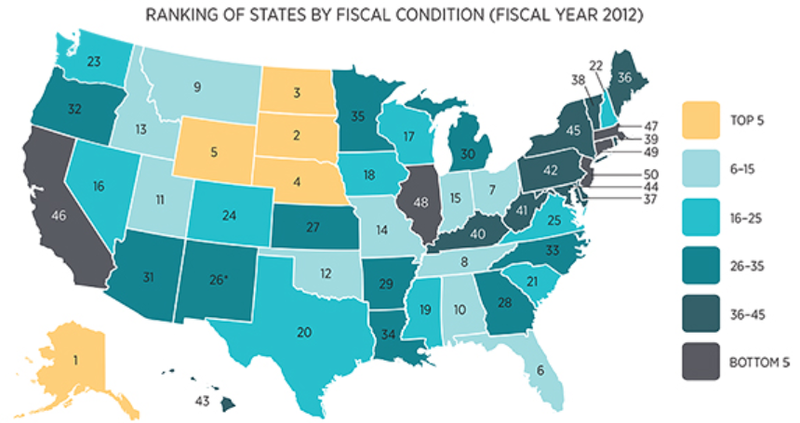 PolicyMic Produced this Chart of State Fiscal Conditions based on the working paper. Let’s return to the original working paper for some highlights and lowlights. At the bottom of the rankings are New Jersey and Illinois. New Jersey faces long-run solvency problems due in part to nearly 15 years of underfunding its state and local pensions. It has an estimated unfunded pension liability of around $25.6 billion as well as $59.3 billion in unfunded liabilities for the health benefits of retired teachers, police, firefighters, and other government workers (State Budget Crisis Task Force 2012). Illinois has also underfunded its public pensions, resulting in an estimated state retirement system combined unfunded liability of $ 96.8 billion as of 2012 (Illinois Commission on Government Forecasting and Accountability 22 2013). To cover the costs of its pension obligations, Illinois has also sold bonds to cover its annual contributions — 60 percent of Illinois’ total outstanding debt is in pension bonds (State Budget Crisis Task Force 2012). In essence, Illinois is using long-term debt instruments to meet current year pension obligations. [In Contrast] Nebraska is constitutionally prohibited from incurring debt. 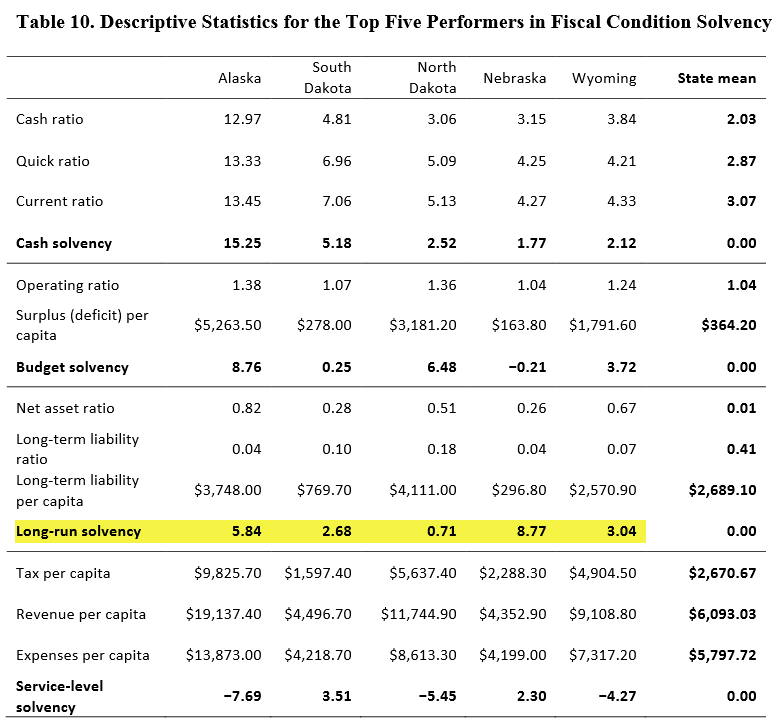 As such, the long-term liabilities reflected in Nebraska’s long-run solvency score are mainly due to claims payable for worker’s compensation, Medicaid claims, and other employee-related items. With no significant bond debt, Nebraska has a much lower long-term liability per capita and a much lower long-term liability ratio than most other states. In terms of long-term solvency (the most critical issue), New Jersey and Illinois are at the bottom of the heap. Pension plans and union activism are to blame. All five states at the bottom of the list have one thing in common: they got that way via “progressive” extreme-liberal politics, fueled by union activism, and promises that cannot possibly be met. Compare to the top five. The top five states all have something in common as well: none of them are the hotbed of “progressive” activism and unions. Although there are other issues, I strongly suggest the performance of the top five and bottom five is directly related to “progressive” politics.